With so many people using their iPhone as their primary camera, the focus has been on how to get photos off that device. But what if you wanted your photos to go the other direction, and put them back on your iPhone? Especially the sort of photos from your family’s history, from the time before there ever was an iPhone. What might be even better is getting all of your favorite photos onto your iPad. With its larger screen the iPad makes a much better replacement for your traditional family photo album than the iPhone does. Apple’s Camera Kit – If the photos you are interested in getting onto your iPad are on another camera or SD memory card, then one option is to use either the Lightning to USB Camera Adapter ($29 Appel Store) or the Lightning to SD Card Camera Reader ($29 Apple Store). If you are still using the 30-pin adapter, then the Apple iPad Camera Connection Kit ($29 Apple Store) is what you need. Each of these devices will allow you do import your photos and videos directly into your Camera Roll. With an SD card, it is possible to transfer your photos from wherever they may be. Wi-Fi Camera Roll apps – Third party apps installed on your iOS device can be granted access to your Camera Roll as well. For the most part, these apps behave in a similar fashion to the camera kit. The advantage is that you can access your Camera Roll using another device over WiFi. One such app is called the Photo Transfer App ($2.99 Universal, Free OS X, Free Windows). With it you can transfer your best photos directly to your iPad’s Camera Roll using a Wi-Fi connection. Directly scan photos – As you go through your traditional photo albums you probably will come across some classic gems that you just have to have on your iPad. The quick and easy way is to take a photo of the app and use one of the many document scanning apps to align the corners properly. Another option is to see if the all-in-one printer you have has an app that will allow you to access the scanner attached to your network. Hewlett Packard, Brother and Epson all have such apps that can be used to scan your photos directly onto your iPad. iTunes Photo Sync – Photos that are already located on your computer can be synced to your iPad from within iTunes on OS X or Windows. The advantage this technique has over using the Camera Roll is that you can better organize your photos into more meaningful albums before syncing them to your device. Simply attach your device to your computer using a USB cable and launch iTunes. Navigate to the Photos tab on the device you attached and check the sync box. Here you can choose which folder you want to copy photos from. About the only major disadvantage to this technique, other than having to sync with a computer, is that you cannot delete any of the synced photos directly. Instead you will have to remove them from the source where you first synced them, and sync with your device once again. Creating albums – One common problem between both the Camera Roll and iTunes Photo Syncing approaches is that you don’t have the ability to truly select and organize your favorite photos once they are on your device. You can create additional albums within the Photos app on the device, but these albums serve as references to the original photo, not copies. This can be frustrating if you were hoping to selectively copy your favorite photos to albums located on your device. My Photo Stream – In a location that is managed separately from both the Camera Roll and iTunes Sync are iCloud’s two photo streams. The great thing about My Photo Stream, the first of the two photo streams, is that all of your devices can have instant access to all of the photos you take with any of your iOS devices. The challenge is keeping more than 1,000 of them around for longer than 30 days. Photos will potentially be removed from your device as per Apple’s published iCloud Photo Stream limitations. This precludes using My Photo Stream as any sort of long-term storage to use as a sort of family photo album. Shared Photo Stream – While not as automatic as My Photo Stream, Shared Photo Streams do not suffer from the same limitations. 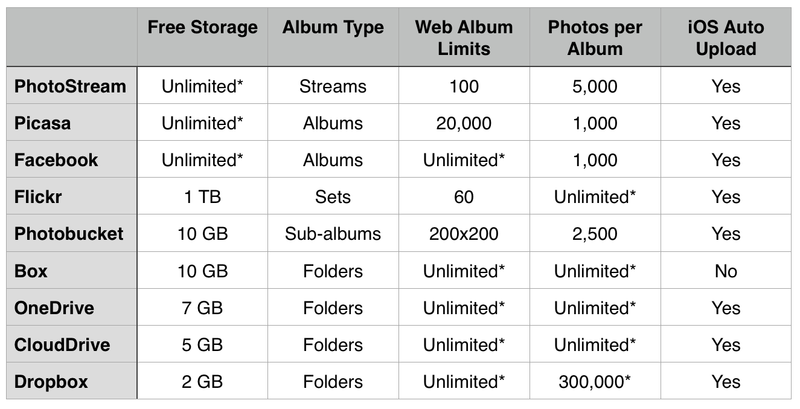 In fact, each Shared Photo Stream you create will keep up to 5,000 photos for as long as you like. With the ability to create and share up to 100 separate streams, you wont be running out of space any time soon. The challenge here is getting photos into your Shared Streams from a location other than your iOS device. iPhoto or Aperture for OS X – For Mac owners, creating and managing Shared Photo Streams is possible using either iPhoto or Aperture. You must first ensure that Photo Sharing is enabled with the account that you set up on your Mac. This is done through the iCloud settings of the System Preferences. Next you will want to turn on Photo Sharing from within iPhoto or Aperture. Once enabled, you will be able to start setting up new Shared Photo Streams directly from your Mac. In order to add photos to a Photo Stream from your Mac, you will need to share them from within iPhoto or Aperture. Fortunately you can share entire albums without having to select each photo individually. iCloud Control Panel for Windows – If you use a PC, you will need to download and install the iCloud Control Panel 3.1 for Windows. Once installed you can access your iCloud account and start setting up Shared Photo Streams. Simply navigate to the iCloud Photos system folder that was created during setup (located in the logged on user’s Pictures folder), right click and select “New Photo Stream”. Here you will be able to create a new Shared Photo Stream, invite subscribers, and even publish your photos on the web. To add photos to your Shared Photo Stream, just drag and drop them onto the stream you created. In many ways the Windows support for Shared Photo Streams is easier to manage than on a Mac. Of course there are plenty of photo sharing services that you can use, each having their own limitations. Most of the file based services are limited to the amount of total storage your account has whereas the photo sharing services impose limits on the number of photos and albums you can have. The thing to keep in mind when considering any of these services is that they are not designed to get photos onto your iPad, they are meant to get your photos onto the web. You then will have to download the photos you uploaded to each service. Something else to consider is that you will need to manage your privacy and security settings in order to control who does and who does not have access to your photos. That’s something that iCloud’s Photo Streams do by default as they were not initially designed to enable public sharing of photos over the web with a browser. This is also not an issue when copying photos to your Camera Roll or syncing them directly from iTunes, as the internet is not involved at all in either process. Given a cost of about $15 each for a traditional pocketed photo album that can hold about 300 photos, and an average cost of about $0.15 to about $0.35 per 4×6 print, you can realistically spend as much as $60 on each family album. That can make solutions like the SanDisk Connect Wireless Media Drive at $99 seem somewhat reasonable. Especially when you realize that you can store as many as 8,000 compressed 22 megapixel photos on one just one 64 GB drive. With its free photo management app, having one or two of these devices could replace an entire bookshelf of traditional albums. You can even display your photos and movies on up to five different devices simultaneously. All around, perhaps the best solution yet. You wouldn’t eat cereal with a fork, so why would you scan photos with a document scanner app? TUAW recently reviewed an app named Pic Scanner. It is meant specifically for photo scanning. You arrange up to 4 photos with a 1 cm between them, and photograph them with iPad. The app splits and saves them as individual photos. So you could scan a whole photo album page instead of scanning one by one. Or scan 1-2 at a time if you need sharper scans. I had loose photos, which I scanned 2 at a time. It was fast and I was pleased with the results. The app has editing and other functions, but for me the automatic cropping clinched it. The app costs $2.99 but trial is free, and if it serves your purpose you may not mind buying it. It is only for iOS I think. I’ve once use an app called iOS Transfer, don’t know if it works on your problem. You may google transphone, I found it by this way. I find it ridiculous that the photo appointment iOS doesn’t ha e the most basic of photo organizing functions. I have figured out how group photos into folders on my Mac and sync them as separate albums through iTunes, but iOS still displays them in apparently random order. I’ve tried renaming them and even messing with the meta data to no avail. The fact that I can’t drag them I to a new order is unacceptable. iOS fail. I ditto the comment about PhotoSync – at holidays like Thanksgiving different members of our family have used it to share photos and videos we’ve taken our own phones, but other family members want to have & keep. PhotoSync has a free software program for Mac and Windows which makes it a cinch to send pictures to iOS devices as well. It’s an extremely flexible app and my favorite way to share photos over local Wi-Fi, between iOS devices and from PC’s to/from iOS devices. My favorite WiFi transfer app has been PhotoSync – Works great – Have it on my Mac, iPhone, and iPad. It’s also installed on all my relatives devices so we can share images when we’re together.